Copyright 1996 - 2019 - Mike Just - Rustic, natural, organic. Elegant root Furniture - Glass Top stump Tables - Art Furniture - Sculpture All images, rustic furniture design elements and other content represented on this web site are protected under United States and International copyright laws and are the sole property of Michael W. Just, unless otherwise noted. All use and/or publication rights are reserved, worldwide. All represented images and content are not in the Public Domain. No images, or furnishing designs represented on this web site may be copied, stored, manipulated, published, sold or reproduced in whole or in part without the express permission of an authorized representative of Rustic Oak, Mike W. Just, TreeTables.com. Simply Ask. Other options: Stone & Glass. I have lined up a few photo's of various table styles with wooden tops scroll down and click links for more info. Table to the right is a light colored upright root table and, has a solid oak (2 inch thick top). This tree stump table, went to Conneticut as a part of a large dining room ensemble which included matching hutch, serving table and, ten cowhide branch chairs. you may see by clicking onto "seating" then chairs in the menu (left). Click onto link below for more on wooden and oak table tops. A rectangular swirling grained Burr Oak Table top.
" 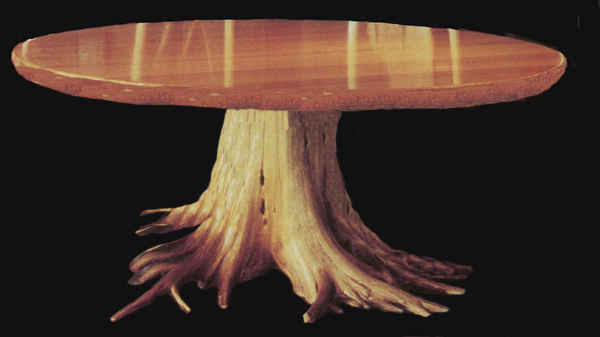 The Jamele root table"
Five foot diameter 1 1/4 inch thick solid oak top with root base. The entire table is solid Swirling grained Burr Oak of Kansas. Top is 1 1/2 inches thick. Also available with burl tops. View a few burl pieces here. 3) Stumps in the rough.